A Draft EIR for the Oak Knoll Hotel project is now available. Given the relentless explosion of hotel projects in Napa, it is only a matter of time before overnight accommodation is included in Napa County's definition for agriculture - just as food service and party events are now - to allow for their construction in the vineyards. 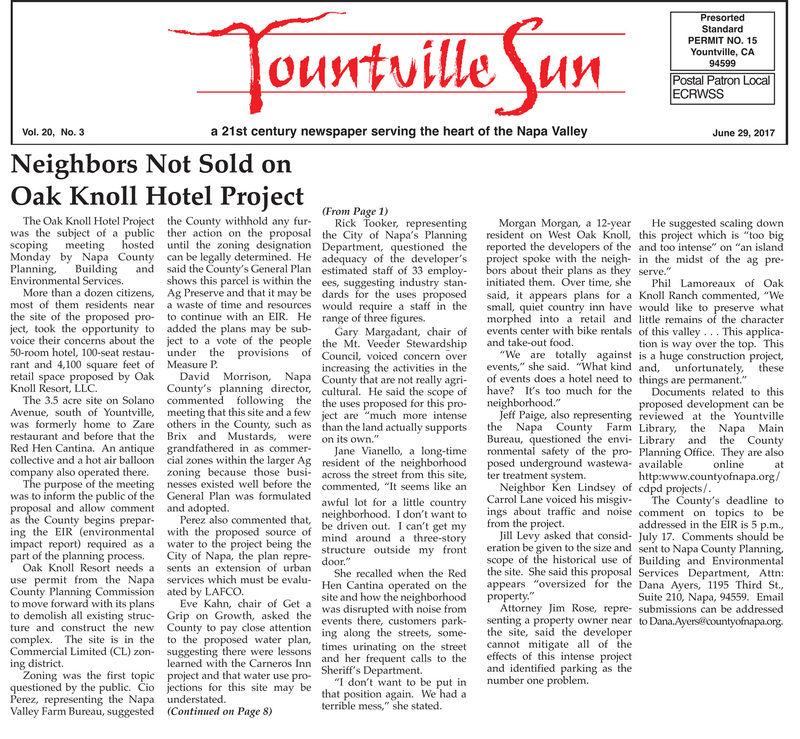 The Oak Knoll Hotel, filling up a parcel on a legacy commercially zoned parcel surrounded by Agricultural Resource zoned land, is a forerunner of a trend that will become increasingly common in the current development frenzy to convert agricultural land to more profitable use. 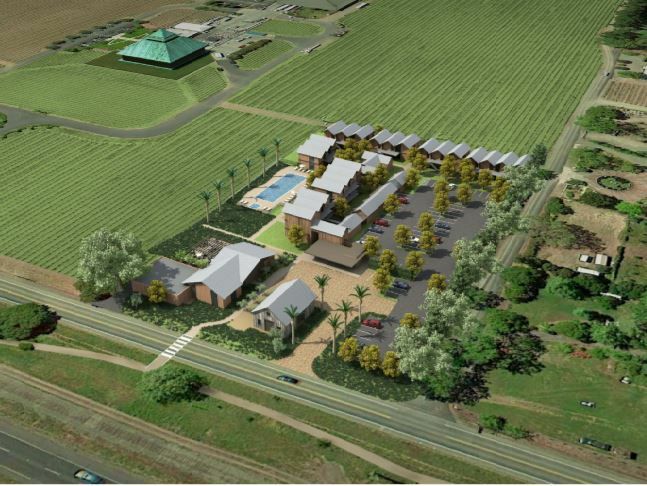 We already have the examples of the Carneros Inn and the Poetry Inn and the approved resort at Stanly Ranch. And the always threatened Altamura hotel at Trancas and the Trail. A highly respected grower-vintner is also proposing a hotel adjacent to one of his wineries and recently another winery hotel is being proposed by the Halls. Again, as with Oak Knoll, the zoning may allow such projects, but the incorporation of overnight stays into the heart of the agricultural landscape, even more impactful than the event-center wineries currently being approved throughout the vineyards, sets a precident that will up the pressure to change the definition of agriculture to allow inclusion of such use on a routine basis. "With respect to Policies AG/LU-44 and 45, due to the small numbers of such parcels, their limited capacity for commercially viable agriculture due to pre-existing uses and/or size, location and lot configuration, and the minimal impact such commercial operations and expansions will have on adjacent agriculture or open space activities or the agricultural and open space character of the surrounding area, such limited development will not be detrimental to Agriculture, Watershed or Open Space policies of the General Plan." This parcel is eminently viable for agricultural use, leased perhaps to the owner of the adjacent vineyards. This project will not have a "minimal impact". The impact of a 50 room hotel, 33 employees and 109-space parking lot, on the open-space character of the surrounding vineyards plus the increased traffic and water and sewer concerns such a project presents, should be a point of contention between the county and the developer. Perhaps the various alternatives presented by staff to the planning commission represent some pushback from the county. But it is not enough. An alternative not presented in the DEIR (which might be considered "2c-No Project-Existing Entitlements Alternative (Agricultural Restoration)") is the use of the property for agriculture. Money can actually be made growing grapes in Napa County. It is not a taking to disallow building construction on prime arable land at the center of the Napa Valley. Paradise is being paved over in one building project after another as the official guardians of the county's rural heritage continue to promote development interests, hoping to bolster government coffers while really just adding to the government expense of maintaining a more urban environment. This project is an opportunity to mitigate that development trajectory and suggest that the urbanization that is currently nibbling away at Napa's agricultural land, with building projects approved at almost every planning commission meeting, can not only be slowed but in fact reversed.